When Is the Best Time for a Roof Inspection? Infrared inspection services can show you trouble spots. An infrared moisture survey can identify problems early. If you are a long-time property owner, you are probably well aware of the consequences that come with your commercial facility changing with age. Many issues gradually begin to crop up over time, some small and some piling into much larger issues requiring more attention and money than you ever imagined. You may be expecting this to unfold with your equipment more than anything else. However, the structure of your facility requires just as much attention and care as the machinery your commercial facility shelters. This holds especially true for your facility’s roof, which much like the rest of your building’s structure, is highly vulnerable to the elements. Weather can chip away at your roof over time, leading to leaks and other forms of decay. An infrared roof moisture survey can help with the problem, but figuring out when you should seek out an inspection can be perplexing. So When Should I Request a Roof Inspection? At three year intervals. This is a rule of thumb for the general well being of your roof and is one of the best methods for detecting problems early. Consider it part of your building’s maintenance, much like cleaning it and looking after your building’s equipment. If you make inspections part of your building’s routine, it will be much easier to catch any issues before they have the chance to unfold into something far worse and more costly for you and your business. As part of your building’s routine surface inspections. It never hurts to be as thorough as possible. There is no strict time limit for this because the time between inspections generally depends on the condition of your commercial property and the type of work performed there. We recommend you follow at least the above suggestion unless your surface inspections take place in shorter spans of time. Before the most severe seasonal weather arrives and again once it passes. The more severe the weather in your area is, the more damage your roof may take. This goes for heat and snow because both present their own detriments to roofing structures. Thermal issues, normally caused by the quick transition between summer heat and rain, and UV radiation can wreak havoc during summer. However, during winter, your roof becomes vulnerable to storms and the winter cold. It is best to make sure your roof is equipped to handle the weather, and once the seasons change, take care of any damage done. 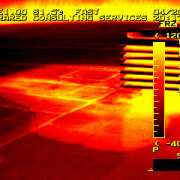 At Infrared Consulting Services, we specialize in the performance and science of infrared thermography. We can help you maintain your roof’s health, as well as inform you of any developing issues you should look into. For more information on what we can do to help maintain your commercial property, contact us. http://irtest.com/wp-content/uploads/2016/03/Color001.bmp 240 320 InfraRedConsulting http://irtest.com/wp-content/uploads/2014/11/infrared-testing-service-logo.png InfraRedConsulting2016-03-10 08:00:142016-06-16 20:08:13When Is the Best Time for a Roof Inspection? Problems always seem to occur where and when you least expect them. This holds true for every aspect of life, from your health to your relationships to your workplace. However, all too often we do nothing about a problem until it surfaces in ways we can’t help but notice. If you’ve ever dealt with a roof leak or any other roofing problem, you know the stress and effort involved in getting it repaired. However, there is a way to detect problems with your roof before they escalate: through an infrared roof moisture survey. You may not have heard of such an inspection procedure, but they are worth investing in for the well-being of your property and your peace of mind. What is an Infrared Roof Moisture Survey? It’s one of the most non-intrusive procedures you can use for a building inspection. Infrared roof moisture surveys evaluate the temperatures circulating throughout your facility and create a report based on these findings. If the insulation in your roofing is wet, it will pull in far more heat than it should, especially at night. A roof moisture survey will be able to pick up on this abnormal amount of heat, allowing inspectors to identify problem areas and to notify you of the sections that need the most attention. 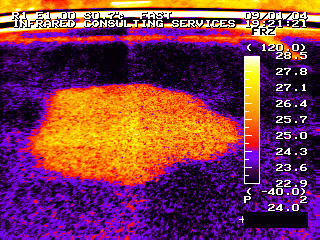 An infrared roof moisture survey can help you locate problems. As the saying goes, “An ounce of prevention is worth a pound of cure”. While a roof moisture survey may sound expensive, its cost will never compare to what you will have to pay to repair damages to your roofing. 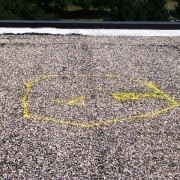 Roof moisture surveys are conducted in a safe, non-invasive manner. They give you the full scope of your roof’s condition so you can make the most informed decision about what needs to be done for your building’s maintenance. A professional thermography inspection will help lengthen the lifespan of your current roofing materials. I can also provide clues to any potential problems before they degrade any further. What Will Happen If I Don’t Get a Roof Moisture Inspection? At Infrared Consulting Services, we specialize in infrared inspection services. We would be happy to conduct an inspection on your property. We make it our business to detect potentially devastating structural issues in your place of business. Then help you tackle them in the most efficient manner possible. Contact us today for more information! If your company’s line of work involves the production of tangible products, we at Infrared Consulting Services know how important it is that every component of your production facilities runs as smoothly as possible. If the slightest malfunction occurs, you risk the possibility of your entire timetable going off-kilter. One valuable form of prevention against time-killing equipment failures is infrared thermography. You can use infrared thermography at your production headquarters to check for signs of wear and hazards in the machinery and other materials you use on a daily basis. Infrared problem prevention services are not only efficient for spotting potential malfunctions, but they are the safest means of doing so for your equipment. Certified thermographers will conduct testing. How Does Infrared Thermography Work? Infrared thermography is best defined as a method of detecting the heat (or thermal energy) given off by something or someone. Humans cannot detect thermal energy with the naked eye and have to use special equipment to pick it up. Areas at risk of breakdown typically give off higher than average levels of heat, making infrared thermography the best way to detect any problems arising in your production machinery systems. This method of troubleshooting first arose during the 1970s and has proved useful ever since. Engineers now rely upon electrical infrared surveys to look for issues in their equipment before they can occur and cause harm to production. These surveys are first performed at the production site, usually far away enough from the equipment under inspection to ensure personal safety, while the production plant itself is fully operational and equipment is working at full capacity. Certified thermographers can then go on to incorporate the survey readings into a maintenance report, which will be delivered by email. Your report will list the source and solution of any problems detected, the placement and name of the equipment evaluated, a depiction of the reading with a colored chart, information on the boost in temperature and the extent of the malfunction, and details on what part of the equipment is faulty. Why Should I Choose Infrared Thermography for My Plant? 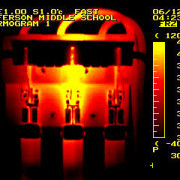 Evidence suggests infrared problem prevention is safe for your equipment, highly cost-effective, quick and efficient. With an infrared reading, you can save thousands of dollars in lost production and damage to equipment. Readings can be performed without interruption of regular production procedures and during your normal working hours, allowing you to continue production during the process. An infrared survey can inspect thousands of termination points in one day, making the process much faster than traditional inspections. This means you’ll see results quicker. Should you decide to utilize infrared thermography for your industrial plant, Infrared Consulting Services hires only the best certified thermographers to perform this service. If you have questions or are interested in our services, feel free to contact us by email or by phone. How Can An Infrared Roof Moisture Survey Keep Your Business Dry? Flat roofing systems often make it more difficult to detect moisture issues, which can have a negative effect on the rest of the structure. This makes getting an infrared roof moisture survey, using infrared thermography, a necessity before you replace the roof or even before you choose to purchase a building. Armed with this information, you will be able to choose whether you need to go through the expensive process of replacing this type of roof. Infrared thermography shows areas of moisture. What Happens to Your Roof? Many of these issues may not be evident in their early stages, which makes infrared inspection services a necessity, especially before you purchase a building. When you get an infrared roof moisture survey, you will learn where moisture exists in a roof and whether the issue requires repairs or a full replacement of the roof. This non-invasive test uses infrared technology to measure the temperature of the roof to map it out thermally. Areas with higher temperatures are more likely to contain moisture than cooler spots. This is because higher density materials retain the heat from the sun for longer. 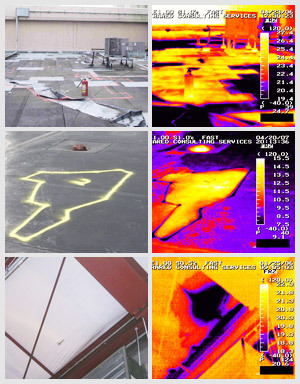 The best part about using infrared thermography to inspect a flat commercial roof for damage is it can quickly and easily determine the exact locations of issues. 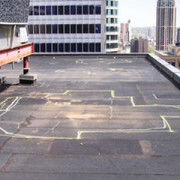 Because a full roof replacement is such a costly job, it’s best for businesses to get repairs done first, if possible. Infrared inspection services can provide a clear map of where the problem areas lie and how large they are so roofing contractors can evaluate the condition of the roof and determine if repair is the best option. This ensures businesses don’t spend unnecessary funds on a replacement. 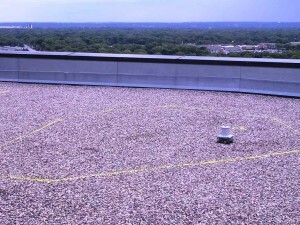 If you’re considering buying a commercial building with a flat roof or you already own one, an infrared roof moisture survey is an absolute necessity. These surveys will use the latest in infrared thermography to identify areas of the roof that may contain excess moisture that can lead to structural issues if not resolved. When you can clearly identify problem areas, you will be able to make the right decision regarding whether a replacement is necessary or a repair will provide the changes needed to protect the structure of your building. If you’re interested in infrared inspection services, contact us. Our experienced team of professionals can inspect your roof and supply a thorough report to help you make the right decisions. http://irtest.com/wp-content/uploads/2016/01/pcoo1a.jpg 480 640 InfraRedConsulting http://irtest.com/wp-content/uploads/2014/11/infrared-testing-service-logo.png InfraRedConsulting2016-01-05 08:00:202016-06-16 20:13:16How Can An Infrared Roof Moisture Survey Keep Your Business Dry? Infrared Roof Moisture Detection – Find & solve problems before they become serious! It’s difficult to fix what you can’t see. ICS technicians use infrared imaging techniques and their years of experience to locate, inspect and provide you with information you need to solve problems before they become serious. As the sun shines on the roof of your building, hidden threats to the integrity of your building heat up. Water, mold and other moisture-related threats retain this heat. After sunset, ICS conducts a detailed infrared roof moisture detection scan. 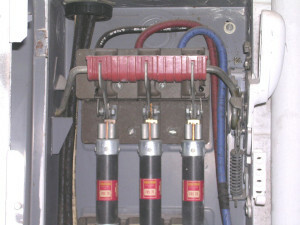 These heat retaining masses are revealed by our equipment. Our detailed survey provides you with the information you need to accurately, efficiently and successfully repair the roof. Why is this important? Trapped moisture can not only cause water damage to the building. Mold formation can cause pose a health threat to you and your employees. Left untreated, these threats can damage the building, reduce it’s value, cause work stoppages, threaten the health of your workforce and even lead to serious structural failure than can cause damage to property and loss of life. Contact ICS today to schedule an infrared roof moisture detection inspection. Or call Toll Free at 1-888-925-4404. Having accurate information can help you manage your facility, make efficient and needed repairs or simply know for sure that your building is providing you and your employees a safe working environment. ICS is a trusted industry leader that’s been providing thermal imaging surveys and infrared inspection services for 35 years. Infrared Electrical Systems Survey – Quickly inspect a large amount of electrical equipment. 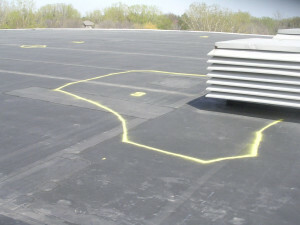 Infrared Roof Moisture Survey – Accurately locate and quantify roof moisture. Infrared Roof Evaluation Survey – Complete documentation of the existing roofing conditions. Infrared Building Envelope Performance Survey – Document thermal performance of walls and windows. Infrared Wall Moisture Survey – Protect structural integrity, identify mold and insect infestations. Baseline Infrared Survey – Document the current condition of certain building systems. High Voltage Electrical Infrared Survey – Promote safety and reliability of power systems. Infrared Mechanical Systems Survey – Document condition of boiler jackets, piping and refractory linings. Infrared Steam Utilities Survey – Find leaks, blockages and other hidden problems in steam systems. Boiler And Refractory Infrared Survey – Find leaks, blockages and other malfunctions in sub-surface manifolds and piping. To discuss your infrared imaging inspection requirements an infrared imaging professional, please call us Toll Free at 1-888-925-4404.
http://irtest.com/wp-content/uploads/2014/09/infrared-testing-service-image-roofmoisture-color.jpg 240 320 InfraRedConsulting http://irtest.com/wp-content/uploads/2014/11/infrared-testing-service-logo.png InfraRedConsulting2015-10-05 07:35:282016-06-16 19:51:25Infrared Roof Moisture Detection - Find & solve problems before they become serious!